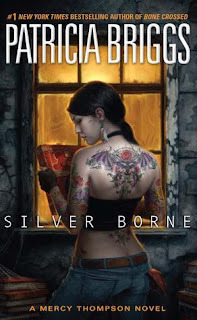 Silver Borne is book five in the Mercy Thompson series. I've been enjoying this series as it progresses and with Mercy finally picking Adam I was curious to see how the pack dynamic would be. While we do see a bit of that, we're mainly focusing on the fae in this installment. We jump right into the mystery element that encompasses each book when Mercy tries to return a book of the fae that she borrowed. The bookshop owner winds up missing and probably in danger so of course she's on the case! We wind up immersed in dangerous fae situations that could potentially harm Mercy and the ones she cares for. In the meantime the bad news is that Samuel is losing control, and his wolf is taking over. That's generally a death sentence for any wolf but Mercy is trying her best to ground him and bring him back before anyone finds out. So basically Mercy is juggling trying to figure out what happened to the bookshop owner and if possible save him while helping Samuel and getting in trouble in the meantime. It lead to an interesting read and I think the fae books intrigue me the most in the series so far. I'm thinking it's because the fae are dangerous and always lead to surprises I don't see coming. Silver Borne kept me on my toes and had me wondering how Mercy was going to figure everything out before time was up. We learn a bit more about the fae, and get to see some new characters in the meantime which is always nice. All in all this was a solid addition to the series and one of the most dangerous situations Mercy has encountered yet. If you're a fan of Urban Fantasy and haven't read this series you need to pick it up! I'm loving the fae books so yeah this was one of my favorites so far! This series is pretty good!! Nice mix of paranormal - fae, shifter, vampires, etc! I am so behind on this series but I love it. I haven't quite gotten to this one and I'm so glad that it sounds as good as the others. WIN! 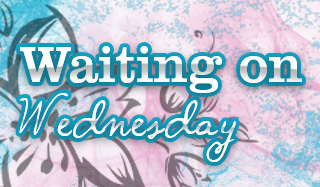 I marathoned the next book as well ;) Should be up next week! Enjoying the series so far. Can't wait to catch up! A ticking clock is a good thing. Well, not for the reader, necessarily. :P I like face paced most of the time! Oh yes. This was a good one and mmhm on keeping ya on your toes. glad to see that book 5 and you are still loving in, I need to give this series a shot. I think I would enjoy the world. I'm enjoying it though a few books were ehhhh to me.